This week our nation will celebrate its Declaration of Independence from Great Britain on July 4, 1776. 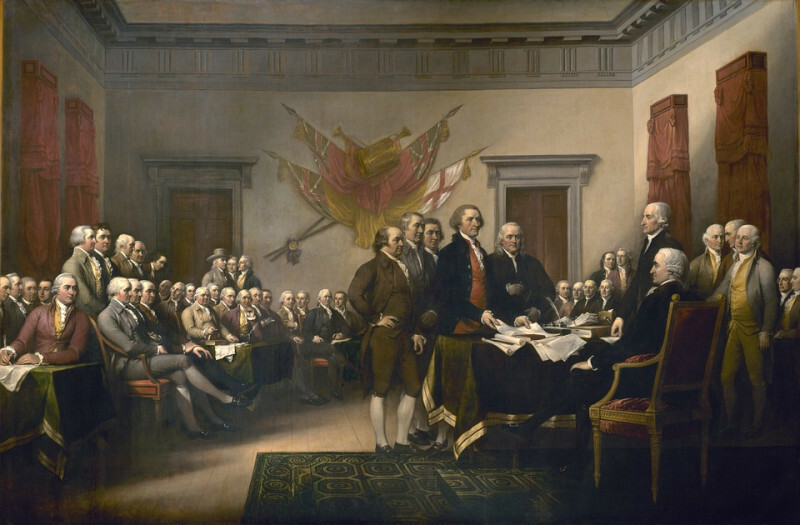 Little do we realize that it was a very dangerous decision for each man who dared to sign that Declaration. England immediately considered them traitors, and if captured, they would be hanged as such. Knowing this, John Adams, who became our second president, had this to say when he signed it, "Whether we live or die, sink or swim, succeed or fail, I stand behind this Declaration of Independence. And if God wills it, I am ready to die in order that this country might experience freedom." It was that kind of patriotism which led men, armed with little more than hunting rifles, to engage in battle with the most powerful nation in the world at that time. Many of our forefathers paid a terrible price in the Revolutionary War, but finally they won the victory so that you and I might be citizens of this "land of the free." But what we often forget is that in declaring their independence from England, our forefathers made an equally strong “Declaration of Dependence” upon Almighty God. The second paragraph of the Declaration begins with these words: "We hold these truths to be self-evident, that all men are created equal, that they are endowed by their Creator with certain unalienable Rights, that among these are Life, Liberty, and the pursuit of Happiness." Again, the closing words of the Declaration state: "With a firm reliance on the protection of divine Providence, we mutually pledge to each other our Lives, our Fortunes, and our sacred Honor." I’m glad for freedom and thankful for those who struggled and gave their lives so that we can be free. But what have we done with our freedom? Unfortunately, we have abused it and confused it to mean we can do whatever we want. Now people want freedom from laws, freedom from responsibility, and freedom from God. As a result, our nation has wandered from the Truth upon which this country was established. Jesus is the Truth. He came that we might know the Truth, and the Truth would set us free. (John 8:32) Instead of following Jesus, many have declared independence from God. Thinking this will give them freedom, they have become enslaved to the tyranny of sin and the devil. Therefore, on July 4, it is vital that we remember this Declaration of Independence also made a very clear declaration of dependence upon God, because strong efforts are being made not only to ignore this, but to eliminate any recognition of the deep and abiding faith of our forefathers in God, who gave this nation its birth and its greatness. That is why many of them say the Constitution is out of date, or in their way. That is why they ignore the Constitution as well as the Bible, proclaiming tolerance as the rule of law. However, tolerance does not exalt a nation. As a nation, we are headed in the wrong direction. Righteousness no longer exalts us. To a great extent, our modern objectives have become success, status, and security. Followed closely by self-indulgence, comfort, and pleasure. To remind us how far this country has gotten away from God, the Supreme Court ruled that it was illegal to display the Ten Commandments on government property. And they did this while the Ten Commandments are engraved in the walls their courtroom! Like King Solomon, these judges have lost their fear of God Almighty and are showing respect to the gods of other nations and the spirit of the anti-Christ. By forsaking the LORD, rebellious judges have escalated the fall of America. Consider their rebellion around this nation in states where they made it legal for homosexuals to get married. Homosexuality is an abomination to God Almighty! God instituted marriage for one man and one woman. This new ruling is an “in-your-face” insult to God! Our judges are not the only ones at fault. For the last two generations, schools and parents have failed to teach our children that with every freedom, with every liberty, with every blessing, comes an accountability to be responsible for our freedoms. When we ignore personal responsibility, we encourage disorder and chaos. So now we’re asking ourselves why our children have no conscience, why they don’t know right from wrong, and why it doesn’t bother them to kill. Probably, if we think about it long and hard enough, we can figure it out. People, who ignore God think they are free. But in reality, they are caught up in sin, enslaved to demons, and are suffering sin’s consequences. We wonder, "Can’t people see what they are doing to themselves and this country?" Sadly, they can’t. They think freedom is no rules, no laws, no borders, and no God. They have forgotten that we are only free when we are dependent on God, not independent of God. With God, we have a greater freedom than any declaration or constitution can grant us. We have the freedom that is offered in Christ Jesus. Salvation is the free gift of God through faith in the Lord Jesus Christ, but His blessing on our lives only comes by allowing God to correct us, by making Him Lord of our lives, and by trusting Him explicitly. The freedom we have in Christ is called "redemption." It means that we have been bought with a price, that we have been freed of our slavery to sin and the devil. Now we have freedom in Christ and the Holy Spirit trains us how to live in freedom responsibly. If you really are a Christian patriot, if you are truly concerned about America, if you earnestly want God to bless our nation—then live a life in harmony with the will of God. Be filled with the Holy Spirit. Become dependent upon Him. Make disciples of Jesus Christ instead of political parties. If each Christian did that, our country would change. Therefore, pray that our country might have grace to repent so we can have a new birth of freedom; not a freedom from God, which always leads to slavery, but rather a freedom built upon dependence on God and obedience to His commandments. Then, as did the founding Fathers of our country, we will find in the LORD our life, liberty, and true happiness. Blessed is the nation whose God is the LORD, the people he chose for his inheritance! As a nation, Americans put far too much faith in themselves. Again, we need to repent of this independent attitude and become dependent upon God, for we are utterly helpless without God. He alone can bring blessing on our lives and our nation. He alone is the One who can lift America out of her selfish and sinful ways. Currently, America is in a civil war of faith. We are not battling flesh and blood, but the satanic spirit of the anti-Christ. Many have joined his side. As Christians, we need to pray diligently that the demonic spirits ruining this nation will be bound and that the Holy Spirit will bring revival to our land and make us one nation under God again. America didn’t get the way she is now, overnight. It has been a gradual degradation over decades. America will not become dependent on God overnight neither, for salvation happens one heart at a time. This calls for Christians to pray, share the Gospel of Jesus Christ, and live for Christ every day, for as long as it takes. During the first Constitutional Convention, the delegates were divided over some of the same issues dividing our states today. These men were so frustrated at not being able to agree on a Constitution that they were all but ready to throw the whole idea out and forget it. Do you want America to get back to God and let Him unite us again? Do you want our nation to turn away from the godless and satanic direction it is now headed? If you do, vote accordingly; but more importantly, pray accordingly. Pray like you have never prayed before. For if you don’t think it is important enough to devote time to praying for America, God won’t think America is important enough to us to heal her. Let’s not wait for God to discipline us to begin praying. God does not say that everyone in the nation has to pray—just His people who are called by His name. That would be us. He calls us to humble ourselves. He calls us to repent. Therefore, if Christians would seek God’s face, turn from their wickedness, walk in His ways, and offer up a persistent prayer, then God will hear and He will heal our land. So this July 4, declare your dependence upon God again, repent, and pray for this nation. When you pray, remember the enemy is not the Democrats or Republicans. It is not the socialist or the capitalist. It is Satan and his demons who influence people and those in power. Bind these enemies in Jesus Name and pray for the Truth of Jesus Christ to enlighten our land once again. Pray that you will have God’s grace to represent the Truth, for we are to be Christ’s ambassadors. What is true for a nation is also true for individuals. If you want God’s blessings, if you want God to hear your prayers, you must become His dependent child through faith in Jesus Christ and His redemptive work on the cross. You must repent of your sin and give your life to Jesus by dying to yourself in baptism. Then you will be born again of the Holy Spirit, making you a child of God who will receive an eternal inheritance and a Kingdom not of this world.